In 2006, while looking through a file drawer of Church memorabilia I found a sketch of a lovely looking pastor, Friedrich C. D. Wyneken. Being the historian of Martini Lutheran Church and a very curious person, I started reading about this amazing man. I never found the same picture we have of him in any research and except for brief reports from our own local pastors, I had not found too not much information about Wyneken’s time in Baltimore. So I will attempt to tell Wyneken’s Baltimore stories. It was a lovely summer’s day on June 28, 1838, when Friedrich Conrad Dietrich Wyneken and his traveling companion, Rev. C. W. Wolf disembarked from the Apollo, a clipper ship piloted by Captain T. Steurje. 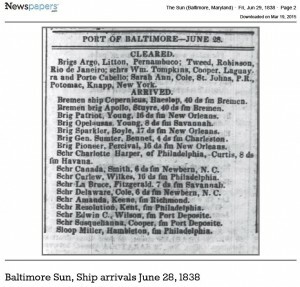 It took 40 days for the two clergymen to travel from Bremen to Baltimore’s Fells Point. The good captain did not charge the men any fare for the trip because he supported their quest to bring the Word and Sacraments to newly immigrated Germans in the American Midwest. Wyneken preached to the captain and sailors during his ocean voyage as did Wolf. Wyneken and Wolf continued wandering through Baltimore’s streets looking for a real Lutheran church. They met the pastor of our mother church, Second German Evangelical Lutheran Church (1835-1867). 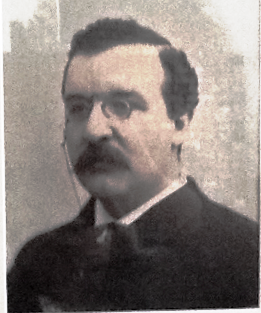 Pastor Johan Peter Haesbeart was an “awakened pastor” as were Wolf and Wyneken. When they got to Haesbeart’s house, Wyneken and Wolf explained that they were missionaries going to help German immigrants in the Midwest. Haesbeart did not believe them. In those days every expelled student or banished demagogue regularly preyed on unsuspecting churches to make some quick cash. Then there were other problems. Wyneken and Wolf were staying in the house of the pastor of Otterbein church, and neither man carried papers or credentials. Pastor H. said “You are staying with a Methodist.” Haesbeart hated the Methodists because they had deceitfully stolen many of his members. Wyneken said “I did not know. I don’t know anyone in Baltimore”. Wyneken’s personality and the testimony of Captain Stuerje soon relieved Haesbeart’s fears and he invited the two men to stay with him. Unfortunately, Pastor Haesbeart became bed ridden. He was so ill that he had to leave the city to recuperate on a farm. He asked his two new German friends if they would postpone their travels and help take care of his church. Wolf decided to set off for Marietta, Ohio alone. 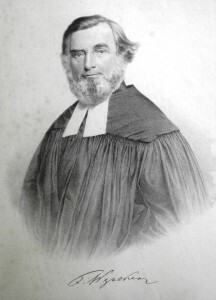 Wyneken stayed in Baltimore and took over the duties of Haesbeart’s church. He often visited the ailing pastor and they became close friends. It took six weeks but Haesbeart did recover. He did not want Wyneken to leave Baltimore, but Wyneken insisted. Haesbeart helped his friend get sponsorship by the Pennsylvania Synod. He received a call from this Synod to go to Indiana, Illinois, and Michigan to gather German Protestants into churches. It was then September of 1838. Haesbeart rode with Wyneken to Havre de Grace, Maryland where Wyneken got on a train to Pittsburg and made his way west. The two pastors continued to communicate with one another through the mail. On October 16, 1844, back in Baltimore, Pastor Haesbeart, never in the best of health, announced to the Church Council he would be resigning as pastor of Second German Evangelical Lutheran Church in three months. He offered the congregation two names for his replacement as pastor – Revs. G. Bartels and Friedrich Wyneken. Haesbeart thought the world of his friend Wyneken and once wrote of him…”Wyneken is a hero of the faith of that time for which a person, as a rule, looks in ancient times, long gone by. Oh how his example shames many of us who live in peace and comfort having abundance of all things, and who are not ready to make the last sacrifice for the Lord and his brethren.” On October 23, 1844, at a regular congregational meeting, Wyneken was elected by a great majority and a call was immediately sent to Indiana. Wyneken was shocked to have received the call to Baltimore. On November 20, 1844, his acceptance letter reached the church. He said it might be March before he could be in Baltimore. He wanted to make sure his church in Indiana was covered by a good Lutheran pastor and his two students would continue being trained to be Lutheran pastors. One of these students, Carl Frincke, became Martini Lutheran Church’s first pastor where he served faithfully for 32 years (another Baltimore connection to Wyneken). Haesbeart left for Louisiana and then later went to Brazil. Dr. Daniel Kurtz a friend of the congregation served as Pastor until Wyneken came to town. Kurtz installed him on March 9, 1845. Pastor W.’s last leg of his trip back to Baltimore was made in a stage coach. He came without his family, and he stayed with the Franz Buehlers, a church family who lived on Market Street. His wife Sophia, a daughter and twin sons joined him in May. On February 10, 1847, the family welcomed Ernst Friedrich Wyneken into the world. He was baptized on February 14. He died on July 17, 1847. He rests in a little grave in St. Paul’s Cemetery in Druid Hill Park. Sophia and Friedrich were blessed with another daughter Maria Caroline Charlotte on May 17, 1848. They first lived on Fayette Street in the older part of the city and then moved to Park Avenue across from St. Alphonsus Catholic Church. The congregation of Second Lutheran had fallen in love with its new pastor during his 6 weeks stay in 1838. But the second Sunday after he came to Baltimore, he discovered there were loose practices in the church. It was a communion Sunday, as Wyneken approached the altar for the confession he was alarmed to see that the sexton had placed a large earthen vessel and a loaf of bread which was sitting next to wafers. He knew by this that there were Reformed members in the congregation. He quickly called the elders up and told them they had tricked him. This was not a Lutheran church. He was lied to. The men assured him they thought they were Lutheran. They wanted him to stay and teach them the correct way to be Lutherans. After the sermon he addressed the congregation and told them they were not a Lutheran church but was a Union church which was a mixture of Lutheran and Reformed. It would be better for them to dismiss him because so much strife and discord would be stirred up if he were to stay in such a mixed body. The congregation wanted him to stay, and the next Sunday he brought a copy of Luther’s Catechism and the Heidelberg Catechism into the pulpit and explained the difference between the two. Many disputes broke out in the church over doctrine and finally 80 members left and built the German Reformed Church on Calvert Street. They looked on Wyneken as their enemy for many years. Second German gave these folks $1,000 to help start their new church. Pastor Wyneken loved music. In his first letter to Haesbeart on October 1, 1838, talking about his journey to Indiana he revealed this. “Sometimes my heart was so full of the sweet cheerful grace of my Savior, that I had to laugh, to sing loudly, to have a joyful heart and to praise the Lord. America is a strange place. Outside of church I still haven’t heard anyone sing. I still can’t believe that Americans can travel and work in such a beautiful forest and not sing. It does not endear me to the people’s personality.” He made sure the singing in Second German Evangelical Lutheran Church would be improved by having the church buy one of Hall’s organs in 1846, at a cost of $800. This organ was later used by Martini Church until 1886. Old St. Paul’s Church had a cantor leading the singing, until the organ was purchased. Another fight was launched by Wyneken against the pseudo- Lutheran body, the General Synod in 1846. In Fells Point in Trinity Lutheran Church was a Pastor Weyl. He hardly had any idea of Lutheran practices. He was a Unionists. Though both pastors were members of the General Synod, Weyl attacked Wyneken by calling him a Jesuit. Weyl was trying to stir up the people of Second Lutheran against their pastor. Some members did go against Wyneken. There was a pamphlet titled “The Straights of the Second German Evangelical Lutheran Congregation of the City of Baltimore” which was circulated around Baltimore. The accusations were against the doctrinal position of Pastor Wyneken. The Church Council took actions against the accusers and asked them to appear before the Council and recant. None did, so they were excluded from the church. Both Pastor Wyneken and the church answered these attacks by Weyl in Walther’s new Missouri Synod’s newspaper “Der Lutheraner”. Resolved: We acknowledge and declare Pastor Wyneken to be a faithful preacher of the Lutheran church and that his preaching is in full conformity with the doctrine laid down in our [Lutheran] Confessions. Resolved: We acknowledge and declare the contrary charges to be evil, slanderous libel. Resolved: We desire that Pastor Wyneken teach and carry out his office among us just as he has taught us until now. Resolved: That those who have brought the charges against Pastor Wyneken – since at the summons of the church Council they have not appeared before it to provide grounds [for the charges] – are as from today excluded from the Congregation and will remain as such if they have not recanted within fourteen days. At the end of this time the name of those who have recanted as well as those who remain excluded will be announced from the pulpit. Resolved: That the foregoing resolution be published in several Lutheran publications. Signed by the unanimous Church Council and the unanimous Congregation of the Second Lutheran Church in this place. Baltimore, the 7th of October, 1846. In actuality Wyneken did everything to keep his people from thinking that the church was going catholic. He refused to have candles, a crucifix or liturgies in the church. He believed the older members would not understand. Wyneken hated the papacy because it took Salvation out of the hands of God’s Grace and added Man’s works. There was the day when a young Catholic priest from St. Alphonsus Church having heard Wyneken was “converting to becoming catholic” walked across the street to invite him to mass. Wyneken treated him with courtesy but in no uncertain terms told the young man what he thought about the horrible papist teaching so clearly that the priest went back to his church and never crossed the street again. On the other hand Weyl’s attack on Wyneken led 40 members of Old Trinity to leave the church, and rent an old firehouse on Gough Street to begin a new church which became Immanuel Lutheran Church. Wyneken and his church left the General Synod, because of doctrinal grounds and began to study the newspaper put out by the Saxons in Missouri. Wyneken had been corresponding with Walther since he was in Indiana. He and his church studied the constitution of the new Synod. On December 7, 1847, a resolution was made by the Council to join the Missouri Synod. And on the same day the church changed its name to Second German Evangelical Lutheran St. Paul’s Church. Pastor and Mr. Buehler took two weeks to get to Missouri to sign the constitution at the Synod’s second meeting. The Synod meeting that year went from June 21-July 1. Wyneken signed his name to the Constitution on June 26,1848. 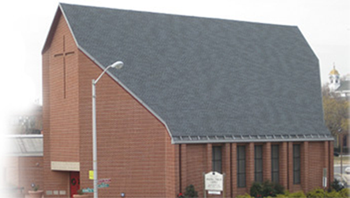 Second German Evangelical Lutheran St. Paul’s Church was the first Maryland church to join the Synod (1848) and at one time it was also the largest church in the Synod with 300 voting members. There were secret societies and lodgism in Baltimore. The Order of the Red Men was the most favored by Germans in Baltimore who organized several lodges. The Odd Fellows was another German favorite. Several members of his church belonged to these lodges. Wyneken opposed these organizations because of their secret religious activities. What was said about the lodges from the pulpit was greatly distorted in the lodges. Much slander and mockery rained down on the Pastor. One day, Wyneken was standing outside of Buehler’s house when the Red Men lodge had just finished a meeting and were in full costume. They marched past W. and tipped their hats mockingly to him. He just stood his ground and smiled. He was a “manly man”. He did not shut the societies down, but preached against them. He was the first pastor to do this in the country, and our pastor is still preaching against becoming members of these groups. Not all was bad in Baltimore during the Wyneken years, there were good times too. One Christmas in 1848 a friend made and painted a “Christmas garden” for Pastor. There was a manger, shepherds in the field and wise men. Wyneken was thrilled like a child. He told the Christmas and Epithany stories to his children using the garden. When friends came by for a visit and saw it, they called it “Catholic”. Wyneken laughed and said “Catholic, I will wander around the world with this thing and let it be seen when I can preach no longer.” The German pastor was a reader of the Baltimore Sun paper. He didn’t really like the writing but wanted to know what was going on in the city and world. He was a devoted father and husband. He shared his home with borders. More than once he gave away all the flour in the house to his wife’s embarrassment. He replied, “Be of good cheer. Dear God is infinitely rich. He will see to it that you will have something to cook and bake again.” His wife also bought her husband a new coat. It hung in the closet because his other older coat was more comfortable. When it was time for his next trip to Synod, she looked to pack the new coat. She asked him where it was. He replied a German candidate for the ministry came to visit and the coat fit him perfectly. He was overjoyed with it. His salary in Baltimore grew to $500 during the five years of his pastorate. He liked to visit his members especially the older ones. He sometimes took the family along on visits. He liked to spend time in the country and visited some folks on Hartford Road. These days Hartford Road is inside the beltway and full of row houses, strip malls and gas stations. The Pastor was very concerned about the school of his church. He said, “Beyond doubt it is the scared duty to have their own children instructed in the Confessions of the Church”. He also felt the same was due to children whose parents attended but were not members. Therefore he felt the whole church should be responsible to take on the burden of a school. Starting in January, every male was to pay $1.00 a year, and females would be asked to contribute as much as they were able. He wanted a principal to be in charge at the main school. For younger children who could not walk the distance to school there needed to be branch schools in their neighborhood with competent teachers. Wyneken thought it was a good idea to have English speaking teachers to attract Americans to the schools. In fact he instructed a woman whose husband was a member of St. Paul’s but she could not understand German. Wyneken gave her an English Bible. an English translation of Luther’s life, a Book of Concord and instructed her in English. He was very diligent in his confirmation lessons to the children. He used only Luther’s Small Catechism and prepared himself for the explanation of it with verses from the Bble. In 1849, the Synod directed him to write a book of Bible Verses to go with the Catehcism called “Spruchbuck zum Kleiner Catechisms Lutheri” which was republished repeatedly. After Wyneken left Baltimore, the time came that there needed to be three branch schools because the church attendance was so large and was coming from different parts of the city. Out of these branch schools became Immanuel Lutheran Church, St. Paul’s Lutheran Church and Martini Lutheran Church. Wyneken was asked to preach at the dedication services of St. Paul’s Lutheran Church and the next year at the dedication of Martini Lutheran Church. He could not be at the December service because of too much snow, and could not be at Martini’s service because he was ill. In 1850 Pastor Wyneken received a call to Trinity Church in St. Louis. He vacillated for some time whether it was a call from God and whether he had to accept it since all serious Lutherans in Baltimore asked him to stay. Although it saddened the congregation to lose him they understood his need to go. He promised that Pastor Keyl would replace him. He preached his farewell sermon on February 24, 1850, on the text 1 Samuel 7:12. Wyneken did not forget his friends in Baltimore. Two days before he died he wrote his last letter to them. The men addressed in this letter became the leaders in the three daughter churches. They learned well from Wyneken’s teachings and missionary zeal. Wyneken would take the sleeve of a man’s jacket or put his fingers in the buttonholes of a man’s coat and speak earnestly with him. 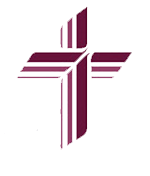 The three daughter churches from Wyneken’s branch school idea became the mothers of almost twenty more Missouri Synod churches in Baltimore and surrounding counties. The congregation Wyneken left in February 1850 bore little resemblance to the one he found when he first came to Baltimore from Germany. The rough diamond had been cut and polished. His successor was the first pastor to step into a truly Lutheran Church in Baltimore. Keyl did not always enjoy fair weather but he did not have to go through the violent storms of his predecessor. Minutes of Second German Evvangelical Lutheran St. Paul’s Church.